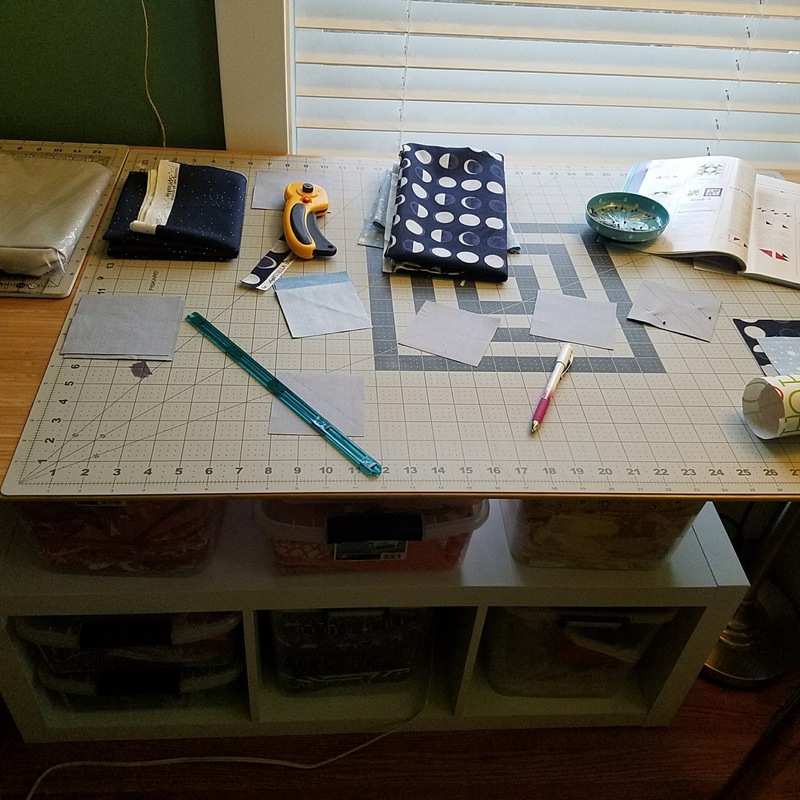 One day I was scrolling Instagram and saw a photo on @patterndrop with @swimbikequilt standing at her cutting table. I investigated more and she has a blog post called New Cutting Table/Favorite Things where she talks about the table and how great it was. Needless to say it didn't take much for me to start dreaming about a taller cutting table. I will treat myself to many "needs" and "wants" but when I have something that works okay I also feel like I shouldn't spend money because I'm able to make do. 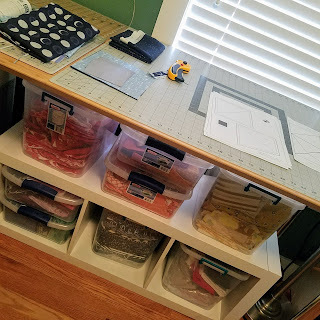 When I stated quilting I pulled out an old drafting table to use for cutting. It worked great. It was a good size and not too low, but low enough that leaning over it caused me more than a few neck and back aches. So I decided I would give myself permission to follow the lead of @swimbikequilt and get an Ikea table with adjustable legs. Here is the final result! As you can see I chose the bamboo top. The reason: it fit my space and cost $9 to ship vs. the $50 shipping cost for the lower cost but heavier tables. So I got this nice top at essentially the same prices as some of the other options. It is longer and narrower than my old table but it fits my space a lot better. I added the shelves underneath for additional storage. Since the window is there I might need to use this space for something else so my fabric doesn't fade, but for the purposes of this post I liked the look of the fabric and colors there. 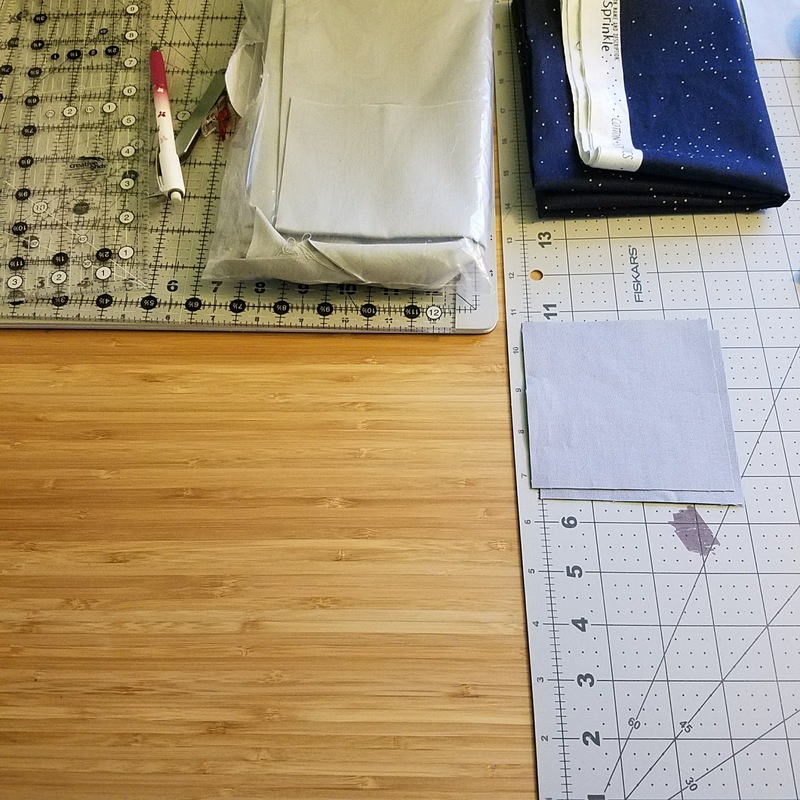 I'm so grateful that other quilters share their experiences so I can learn from them. I would have kept hunched over my table if I hadn't seen this photo on Instagram. The money I'll save in chiropractic costs will definitely pay for the table! I've only used it a few times but it is so helpful. Let me know if you have any other helpful tools I should try! Thanks for sharing this. I tend to cut on my dining room table. Sometimes I use risers but not always so then I end up with the back and neck issues. Well I am no 5'9" as Katie is, but having a countertop at the right height is invaluable; my husband shortened the cabinets we bought from Home Depot by 2" so they'd be the right height (or shortness, lol) for me, and yep, it's invaluable for sure. Thanks for the links and the great pics of what you did. I like your bamboo decision. I love your vibrant colors!